Over time the life of any boat there will come a time when the deck needs to be renewed. You have a choice of non-skid additives, or paints that already contain nonskid compound. A non skid boat deck helps protect the surface as well as the occupants. Looking for a non skid surface you have many options. 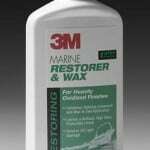 If your boat floor is currently gelcoat you can regelcoat the surface with or without a non skid additive. More information about gelcoat application can be found here. Gelcoat is more durable than paint and once a gelcoat surface is painted gelcoat will not adhere. If paint is desired non skid can be added to our marine paints by Duralux , Awlgrip, or Mono Epoxy by Top Secret. Often an exact match can be found to your hull paint color. Find more topside paint options available and detailed instructions on adding non skid found in our how to section. Customers painting the floor of a jon boat, frequently use the Aluma Hawk aluminum paint with a non skid additive. This paint serves as a paint and primer in one for your aluminum surface. Floor-Grip is ready to apply non skid surface. It’s an exceptionally tough non skid floor coating that features three different sizes of aggregate added to a durable industrial-marine urethane. It produces an attractive finish sure to get attention. 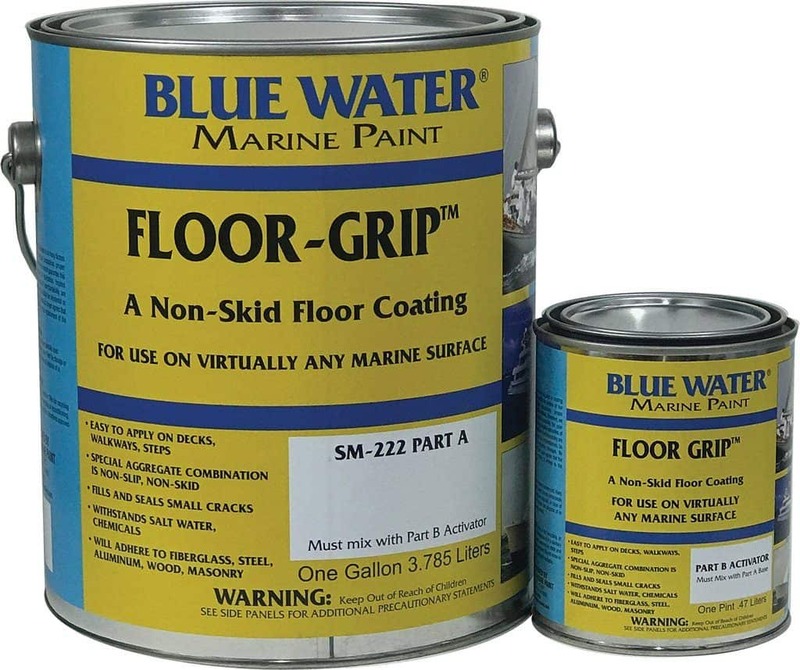 Floor Grip is available for fiberglass or wood surfaces. Depending on your paint choices, follow the manufacturers application instructions whether applying to aluminum, fiberglass, or wood to insure best adhesion and slip resistance. This entry was posted in Aluminum Application, Boat Finish Restoration, Boat Repairs, Boat Safety, Frequently Asked Questions, Gelcoat, Non Skid Paint & Additives, Topside Paint and tagged boat deck, boat floor, deck paint, non skid on March 11, 2019 by Jason Revie. The waterline can also refer to anyline on a ship’s hull that is parallel to the water’s surface when the ship is afloat in a normal position. There are many reasons a waterline needs to be marked, it is a new vessel, the old paint has been blasted off for a new finish, or you’ve loaded it up with more stuff the original marking is off. Marking the waterline is often met with dread and getting the correct line for your bottom paint will provide stunning results. Getting it wrong, especially when paired with a boot stripe, will stand out like a sore thumb. If your boat is new, the waterline should be marked on the designer’s drawing, if that is available. If not, you can take the measurements from a similar boat. If the boat has been in the water, even a few days, there may be some slight staining along the waterline (or just float the boat) that can be marked with a grease marker (best if it is full with fuel). Others have advised to throw sawdust in the water around the boat. Haul the boat and see where the sawdust has stuck to the wet hull. Fine-line masking tape is ideal for this because it has some stretch and conforms very well to hull shape, especially if the hull has a lot of reverse turns. Don’t press the tape too firmly yet – you may need to peel it back for small adjustments. Once you’re happy with the whole line, press the tape firmly against the hull. Since the boat is already level, all you have to do for the second side is to set the level at the correct height and mark the stern with a piece of tape or transpose the wax crayon mark. When the boat is aligned athwartships, set up the laser tripod, the exact spot is not critical providing the laser beam can see the whole side of the boat (if you can see it, so can the laser beam). Turn on the laser and adjust the height of the beam until it touches the marks you made at the bow and the stern. If it touches the mark on the bow but the stern is too high, lower the jack-stands at the stern or raise those at the bow—vice versa if the stern is low. Double-check the spirit level in the cockpit to make sure you’re not tilting the boat. This entry was posted in Boat Finish Restoration, Boat Maintenance, Bottom Paint, Frequently Asked Questions and tagged Waterline on February 26, 2019 by Jason Revie. What is a Boot Stripe? The Boot Stripe is a narrow stripe that runs the length of the boat and is usually positioned a few inches above the waterline. The stripe provides an aesthetic touch and creates an optical illusion that makes the boat appear to be longer. It also gives the boat a nice “finished” appearance that many boaters take pride in. Boot stripes also define the separation between anti-fouling paint (below) and the topside paint (above). Vinyl boot stripe tape is available in different widths, colors, and designs, but unless the boat has a flat, slab side this will make the boat appear to sag or squat in the water. Painting the boot stripe on the hull allows the width to change with the geometry of the boat and give the finished stripe a uniform look. Repainting an existing Boot Stripe will be easier than starting from scratch since you won’t have to mark and score the stripe. Find and mark the Boot Stripe. The boot stripes of many fiberglass hulls are cast into the hull from the mold by the manufacturer. They can only be removed if you sand down to the fiberglass. 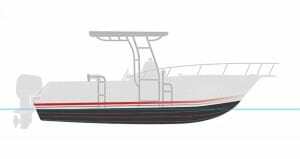 If there is no stripe on your hull you will need to mark the waterline on your boat and transcribe it up to the desired height of your stripe. This can be done by applying successive layers of masking tape along the waterline curve. 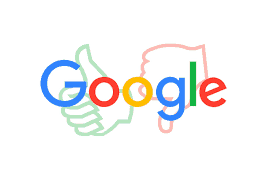 There are other numerous methods worth investigating online. Also, consult a professional and ask them questions about your specific boat. Mask off the stripe with tape and get within 1/32nd in. to the edges of the old stripe. This will allow you to sand to the very edge of the old stripe, and avoid damaging the surrounding gel coat. De-wax the stripe area using a de-waxing solution and a rag. Sand only the stripe area with 220 grit sandpaper. Once sanding is complete, remove the masking tape and wipe the area with acetone. This will remove any remaining adhesive and sanding remnants. Sacrificing the first mask will contribute to a sharper finish. It is possible that the first application of tape can transfer sanding residue to the paint and result in a poor finish. Mask twice and you will only have to paint once! Be sure to take your time with the second masking. Remember: If the stripe doesn’t look good in tape, it will look even worse once painted. Now you’re ready to paint! There are many different varieties of topside paint suitable for painting a boot stripe, but we have narrowed it down to just a few options for you. Good: Duralux Marine Enamel – Easy to use, economically viable, with a nice color selection. 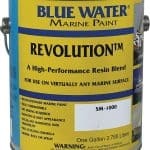 When applying this marine enamel to fiberglass, no primer is needed. Simply wipe the surface with acetone before and after sanding, then apply your paint. For aluminum, prime with one coat of Duralux Zinc Chromate and apply 2 coats of paint. This high gloss enamel will create a bright and colorful boot stripe on any vessel. 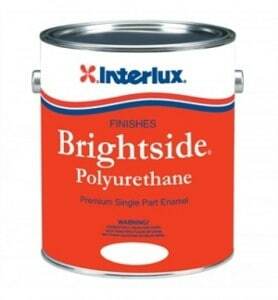 Better: Interlux Brightside – One part Polyurethane with a crisp, high gloss appearance. It is more durable than regular enamels, but just as easy to apply! If you are applying Brightside to fiberglass, make sure the surface is clean and in good condition. Remove wax and other contaminants using Fiberglass Solvent Wash 202 and then sand with 220-320 grit paper. Apply Pre-Kote. Brightside offers excellent flow and gloss retention especially for painting a boot stripe. 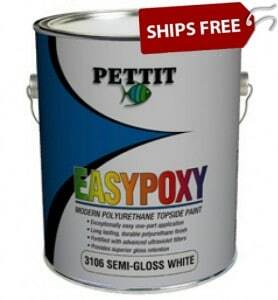 OR Pettit Easypoxy – Another single-stage Polyurethane that provides a nice sheen of gloss and durability for painting a boot stripe. However, the color selection is more limited than Interlux Brightside. Easypoxy is only available in black, white, and off-white. Both products produce a high quality finish and are easy to use. Best: Revolution SM-1000 – Exceptionally beautiful paint.. Revolution produces a bright and smooth finish, self levels like a dream, and will last longer than other topside paints. Ideal if brushing is your only option. An Etching Primer is recommended for most surfaces. Revolution will keep your boot stripe (and your boat) looking like new. This entry was posted in Boat Finish Restoration, Topside Paint on March 10, 2016 by Jason Revie. A gelcoat surface is a very smooth, mirror-like finish when it is new. As gelcoat ages, it becomes porous which means the more easily it stains, the worse it looks and the harder it is to clean. Most all gelcoat can be restored, providing it is not completely worn through. Exhaust stains, like diesel, can develop on the surface of the Gel Coat. These stains can set in on the wax surface of the gel coat but the right cleaner can remove them. If the stain goes deeper, a bit of elbow grease will be needed. Clean and inspect the surface with a wash with a mild cleaner like 3M’s boat soap or some alternative stronger cleaners if needed. After cleaning, dry and inspect surface for needs to be addressed: scratches, dings, cracking and crazing and to fix these flaws before rubbing out the gelcoat and restoring its shine. See the fiberglass/gelcoat repair section for options and the West System Video for “how to” instruction. Apply a fiberglass stain remover, like 3M Fiberglass Restorer and Wax , Mothers Marine Black Streak Remover, or 3M Marine Cleaner and Wax to the stained gelcoat area with a clean rag. The black/gray stains are the result of soot being deposited on your hull. It can happen when wet exhaust systems mix the exhaust gases with seawater and discharge those gases or dry exhaust systems discharging the soot directly into the atmosphere and it lands on your boat. These liquid one-step products that combine a polish or compound with a wax remove oxidation, and protect the gelcoat in one step. Wait 10-15 minutes. If the stain is simply laying on the surface of the Gel Coat, the stain will begin to loosen; rinse and inspect the results. If the stain is lifting, repeat. If not, then something stronger like a more abrasive compound with a polisher may be needed; in that case a wax will be needed to restore the shine. Each time compound products are used, some of the gelcoat is removed. Use caution to use the least aggressive product that will get the job done. Frequently all that may be needed is to apply a protective coating of wax, such as 3M Ultra Performance Wax, Scotchgard Marine Wax, or Mothers Marine Synthetic Wax to help keep that shine. For more gelcoat restoration tips see our how to Maintain and Restore Gelcoat link. This entry was posted in Boat Finish Restoration, Boat Repairs, Gelcoat and tagged gelcoat restoration, Gelcoat shine, gelcoat stains, Mothers Products, remove stains from gelcoat, removing gel coat stains, stains in gelcoat on September 5, 2012 by Jason Revie. The most common practice for the do it yourselfer is priming the boat with Awlgrip 545 epoxy primer. This is a 2 part primer, so you will need the base (either white or grey) and the converter. Awlgrip also recommends a reducer. The links to the converter and reducer can be found on the base primer product page. This is a two part system. You must order the base primer in either gray or white along with the D3001 Converter in the appropriate size. The mix ratio is 1:1 so if you purchase 1 quart of primer you also need 1 quart of converter for a total of 2 quarts. Additionally you need to purchase the appropriate reducer (spray or brush) for spraying reduce up to 25% with T0006 and for brushing reduce up to 10% with T0031. 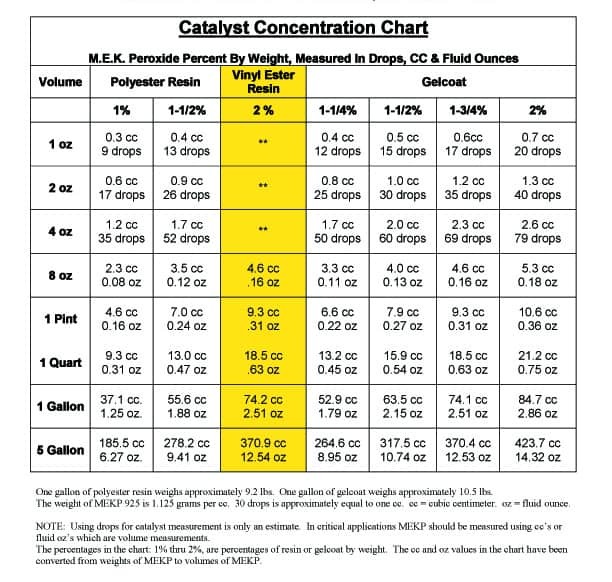 Theoretical Coverage: 497 Sq feet/gallon at one mil dry (25 microns) 165-248 Sq. Feet at recommended dry film thickness. Calculated based on a theoretical transfer efficiency of 100%. Then you will choose your base color of Awlgrip Topside paint, the converter and reducer. The reducer and converter change depending if you are spraying or brush/rolling. Spray: Mix by volume one part AWLGRIP Topcoat Base Component (Color) with one part AWL-CAT #2 G3010 spray converter to a a smooth homogenous mixture. Reduce up to 25% with the spray reducer(s) appropriate for conditions. Overall mixture is 1:1:1/2 volume. Example: 8oz Base, 8oz G3010, 4oz Reducer. 25% reduction is a standard mix. Clear coats. metallic colors, and painting in high temperature conditions may require additional reduction. 40% reduction is the maximum recommendation. Brush/Roller Application: 700-725 Sq. Feet at 1 mil (25 Microns) dry: 285 Sq. Feet at recommended dry film thickness. Recommended Wet Film Thickness: 4.5-6 mils (112.5-150 Microns), Total of 2 Coats. Recommended Dry Film Thickness: 2-3 mils (50-75 Microns), Total of 2 Coats. You can view the links provided above to see more information about the products, mix ratios, surface prep and auxiliary products. 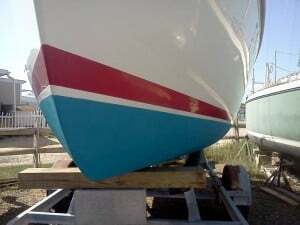 This entry was posted in Awlgrip, Boat Finish Restoration and tagged awlgrip, awlgrip paint application, awlgrip topcoat, awlgrip topside paint, how to use awlgrip on January 9, 2012 by Jason Revie.